Welcome my crafty friends so glad you stopped by. Today I have a card that I created for a very special friend’s birthday using Susan’s Garden Notes Nasturtium, Wooden Crate, Berry Branch along with ModaScrap Happy Frame. Here is how I created card. Step 1 Cut 4 Garden Notes Berry Branch from brown cardstock with Clear Double Sided Adhesive on back adhere together so you have 2 stems. Add shading using Distress Ink. Add berries using Nuvo Crystal Drops – Violet Galaxy. Set aside to dry – when dry repeat on back side and let dry. Step 2 Form 6″ X 6″ card base. Step 3 Create 6″ X 6″ Happy Frame from cardstock of your choice – ModaScrap – Wood Effects used here. Els has tutorial for creating frame which can be found here. Step 4 Chose a background the one here was done on 5-3/4″ square white Soft Finish Cardstock using Distress Oxide Inks. Adhere to card front using Clear Double Sided Adhesive next adhere frame to card front using Clear Double Sided Adhesive. Step 6 Cut 2 Garden Notes Wooden Crate 1 from Wood Effects cardstock and 1 from either black or brown cardstock both with Clear Double Sided Adhesive on back. Adhere Wood Effects on top of solid. Depending on color of background you will want to put a little something behind crate so background doesn’t show through. Moss ribbon was used on this card. Using Clear Double Sided Adhesive to adhere to card front. Step 7 Add nasturtiums and berry branches to crate using Kids Choice Glue. Step 8 Using Suzanne Cannon’s A Way With Words Happy Birthday – small cut 2 from black cardstock with Clear Double Sided Adhesive on back stack together add to card front. Thank you for stopping by today and hope that you have been inspired to create. 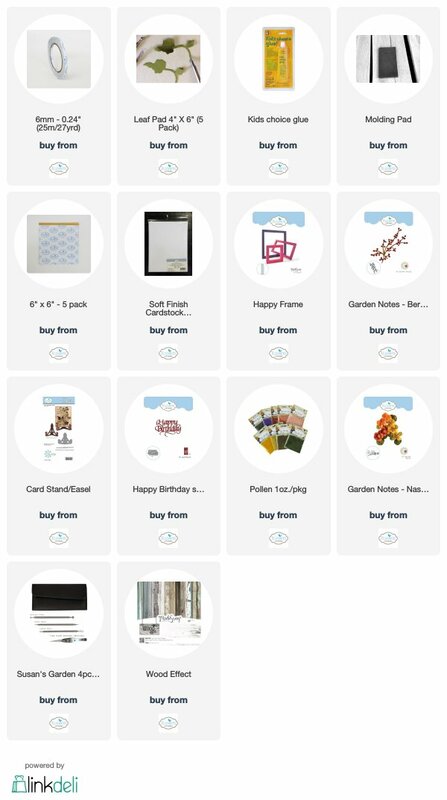 For any of the Elizabeth Craft Designs supplies used just click on picture below it will take you to their site.